Are you meticulous with the items that get to be in your zone - your kitchen? Well, you're in luck because today I get to reveal the best immersion blender we found in the market. We only want the best ones, right? Let's get to the nitty-gritty of immersion blenders then! What Are The Benefits Of Using Immersion Blenders? 1. Unplug When Changing Blades Or Cleaning After Use. 2. Keep The Blender Away From Water. 3. Maintain The Blade's Sharpness. Immersion blenders are also called hand blenders. Some call it stick blenders. Why? Because it's handy and much smaller in size compared to the regular blenders that we use for making smoothies and fruit shakes. They're excellent for blending small amounts or small sizes of food and for making different types of sauce. What's the most popular food we make using stick blenders? Mayonnaise! Watch this quick video on how to make mayonnaise using an immersion blender. If you wish to make a simple soup, mayonnaise, or mashed potatoes, this is the best type to use. It's very forthright and comes with no complicated mechanism. It's primarily a hand blender which you turn on and off. Cordless immersion blenders use rechargeable lithium-ion batteries. They're powerful, but not quite as corded ones. Because of the convenience cordless tools bring, cordless immersion blenders are more expensive in the market. If you travel a lot, are on a specific diet and would need to blend your food, then getting a cordless type would be worth a few more bucks. If you're into fancier tools, I'm sure you'll find the multi-use immersion blenders fitting. Usually priced at less than a hundred dollars, this type comes with accessories and a range of attachments including a chopper and a whisk. If nuts are a staple in your diet, you'll need a multi-use stick blender. It'll efficiently chop nuts and even cut your vegetables into smaller pieces. I don't know about you, but during my weight loss journey, my strict diet required smoothies and fruit purees. I traveled a lot in those years, and so I had to bring my cordless hand blender wherever I went. I found it incredibly convenient to have my blender with me so that I could stick to my diet. There wasn't any moment I strayed from healthy eating, thanks to my blender's portability. Albeit pricey, we'd all love to have the latest KitchenAid mixers. However, it isn't always in our budget to upgrade our kitchen appliances; so it's quite bracing to see terrific useful gadgets like immersion blenders priced reasonably! Basic hand blenders cost $40, more or less. Do you agree that it's when we get too comfortable that we disregard safety and handle our kitchen tools and equipment carelessly? It's not uncommon for accidents to happen in the kitchen, especially when it involves immersion blenders. They can be as simple as a small cut from the blade to electrocution. Don't forget that hand blenders are still an electrical appliance. 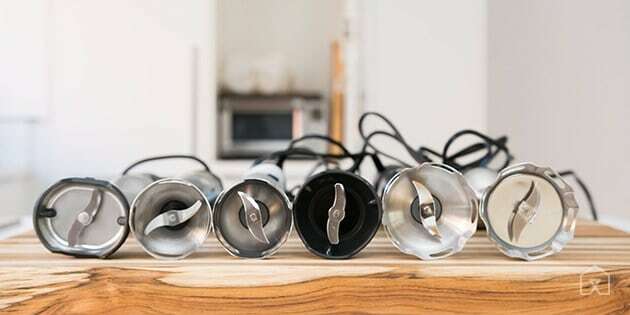 Except for cordless ones, immersion blenders connect to an outlet and a slight bump can trigger the mechanism to power up while your hands are near the sharp blades. Be extra careful if your blender doesn't come with a detachable blade. Never let the immersion blender sit near a water source or on a wet counter. If you're not using the cordless type, you're more prone to electrocution if you don't handle the blender properly. Over time, expect your blender's blades to go blunt. With good maintenance, you can keep the blades sharp. With sharp blades, you won't have to exert further force when blending, which is often the cause of regrettable slips and loss of control. If you're looking for the ultimate all-in-one hand blender that's genuinely easy to operate, then the Epica 4-in-1 is your best bet. It's one of the most reliable kitchen tools available in the market today with its multi-speed setting and a powerful 350-watt motor. The Epica is designed for easy blending with its one-click attachment release and multi-speed feature. From mashing potatoes, pureeing fruits, chopping carrots to making daiquiries, your Epica 4-in-1 immersion hand blender will get things done. 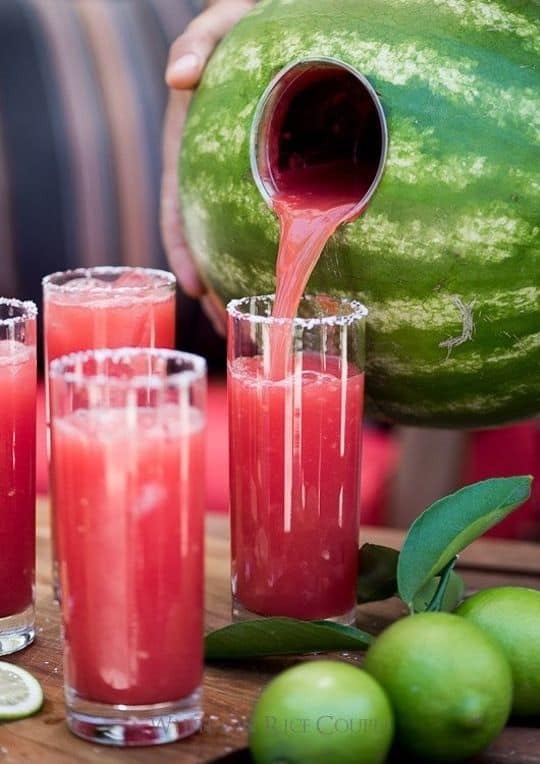 Don't fret on the after-blending scene. This tool is easy to clean. Just put it inside the dishwasher and let it deal with the mess. A little bit on the higher end, the Breville BSB510XL Control Grip Immersion Blender provides a more efficient blending power with its cutting-edge bell-shaped base. You don't have to worry about blending larger quantities of food with this innovative stick blender as it features an 8-inch immersion depth. How many times have you scratched your pots and pans with your previous blenders? Well, the Breville BSB510XL features a non-scratch base, allowing you to directly use the blender in your precious containers. This multi-use blender has an impressive 280-watt motor and 15-speed settings. Wait, have we mentioned it can crush ice? Even with a 3-speed setting, the KitchenAid KHB2351CU holds well over time with its stainless steel and strong plastic construction. 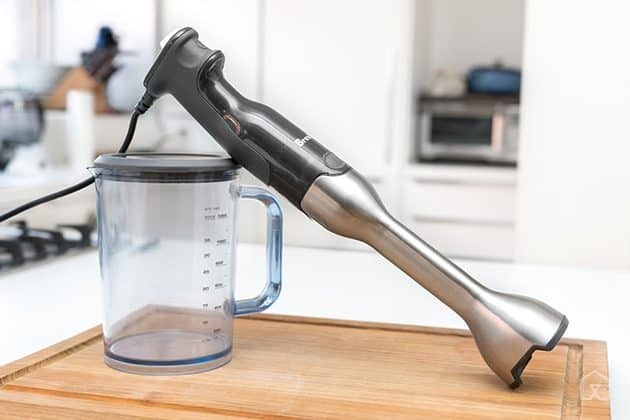 This handy multi-use immersion blender has a 5-ft long cord that allows for comfortable use. It comes with a whisk and chopper attachments that also let you crush and chop foods with the correct motor speed. Perfect for baking pastries such as cakes or pies with toppings, you can use this KitchenAid blender for everything you'll need - crust, icing, cream, and nut toppings. Quickly mix, whip, or puree your food with the Hamilton Beach 59765 two-speed immersion blender. 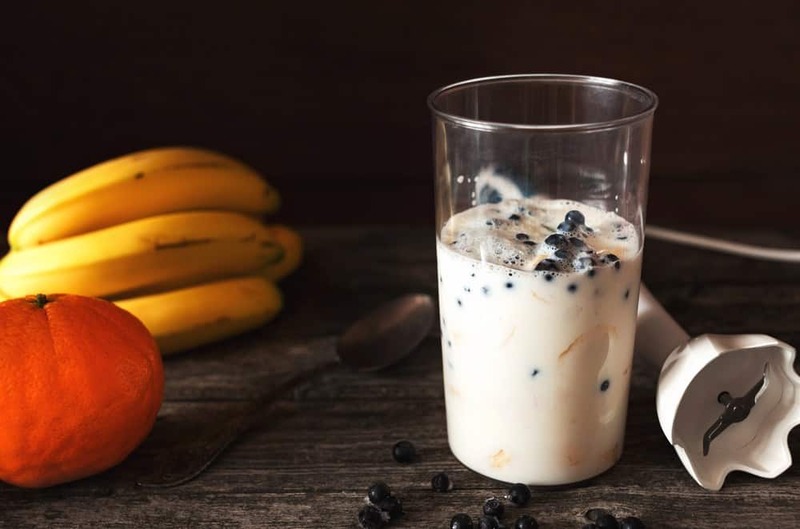 There's no need to use a separate container when blending because with the blade guard, you can directly blend your food in its container without worrying about scratching or glass breaking. Unlike other hand blenders in the market, the Hamilton Beach 59765 is easy to maneuver with its 5-ft long cord. Accessories and attachments such as a mixing cup, whisk, and chopping bowl are included in select models and are all dishwasher-safe. This multi-use immersion blender is an all-in-one blender that caters to your blending needs. 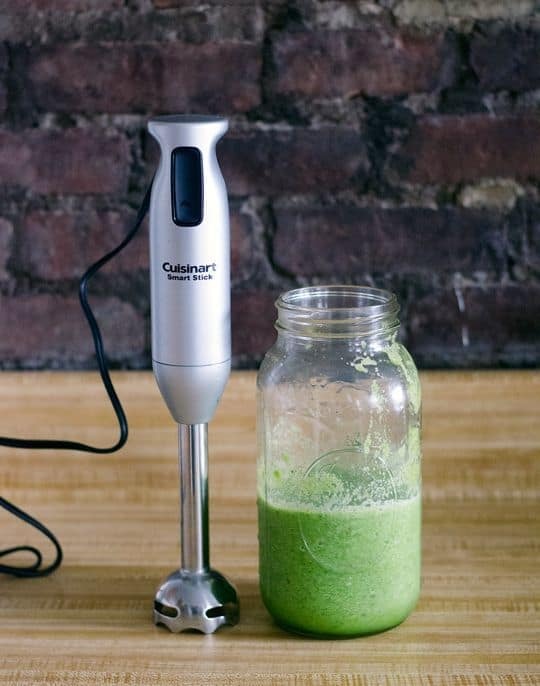 The Cuisinart Smart Stick CSB-75BC is a 200-watt, two-speed immersion blender that comes in elegant brushed chrome, pastels, and bright colors for the handle. This easy-to-use kitchen tool makes blending hot soups, batters, dressings, and even cold drinks a breeze. Thanks to the grip's ergonomic design, the basic immersion blender is comfortable to hold and operate. You'll find it easy to prepare food with either two speeds - high or low. The 15.75-long blender allows you to blend food in a pitcher and other deep containers. And you don't need to worry about the minimal mess. The Cuisinart Smart Stick is dishwasher-safe, making cleanups almost effortless. Although all five can be an excellent addition to our kitchen, we take our hats off to the Epica 4-in-1 Immersion Hand Blender. Why? 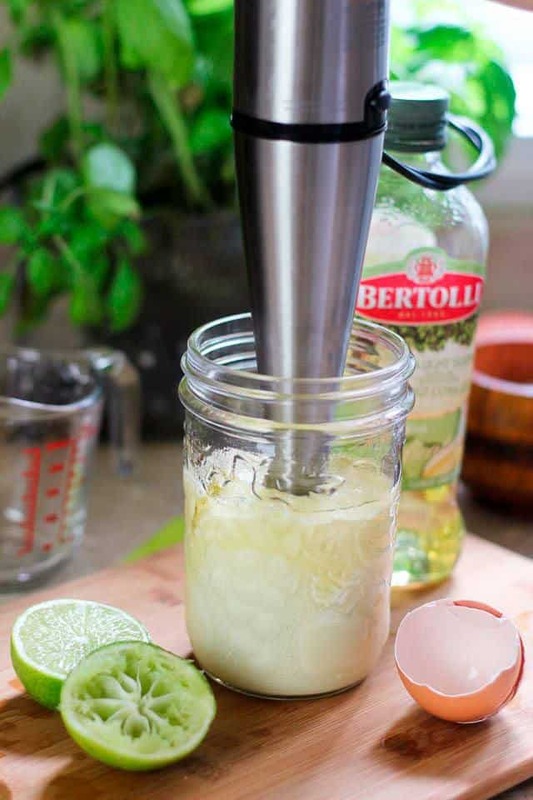 Because this multi-use blender with its multi-speed settings and powerful motor make it easy for us to create foods we genuinely enjoy eating - like mayonnaise, purees, and daiquiris! If you don't mind holding a great stick blender that weighs 4.5 pounds for a few seconds, then we suggest you get the Epica 4-in-1 Immersion Hand Blender. The features are ideal for almost all food blending needs, and considering value for money, the Epica comes out unmatched. An immersion blender is not the only choice for those who need a small blender. I hope that the article about best small blende﻿﻿r wll help you find a blender that meets you needs.